There are three elements to any personal injury case. Element #1: Liability: How did the accident happen and who’s to blame? The concept of liability is straight forward in many cases. A drunk driver runs a stop sign resulting in catastrophic motor vehicle accident. Establishing liability against the drunk driver is easy to establish. The driver was drunk and on top of that, they ran a stop sign. The drunk driver is at fault of the car accident. Liability is established. Sometimes liability isn’t so clear and an engineer or another expert will need to be retained to look in to this issue. This expert will be able to tell us whether or not we have a case and whether or not we can place blame on another party of the event giving rise to the litigation. Element #2: Damages/Injuries: What are the injuries from the car accident. Is it a simple bruise which goes away in a week, or are the injuries severe, like a brain injury along with multiple orthopedic injuries. Understanding this concept is somewhat straight forward as well for many accident victims because it’s easy to visualize and more tangible than other legal concepts. If Superman were involved in a car accident, chances are he wouldn’t have sustained any injuries or damages. Hence: he wouldn’t have much of a personal injury case if Superman weren’t injured. Sorry Superman. Element #3: Causation: : There must be some form of connection between the Bad Guy Defendant’s conduct and the Accident Victim’s injuries. This term is sometimes called “remoteness of damage” or “proximate cause“. Either way, this third element is the most difficult for accident victims to understand. Sometimes causation is easy to prove. Suzy broker her leg in a car accident. Suzy is seeking compensation for her broken leg from the car accident. Thomas slipped and fell and bumped his head. Thomas is seeking compensation for his head injury from the slip and fall accident. But sometimes causation is not so simple/clear. Johnny was in a car accident and hurt his knee. Now Johnny complains of headaches, fatigue and shortness of breath. Alice was bit by a dog and sustained abrasions to her legs. Now Alice is deeply depressed and can’t sleep. Marvcus lived in a mouldy apartment building. Now Marvcus has a bad cough. Marvcus has since moved out of the apartment building but still has a bad cough and can’t sleep properly. The focus of this edition of the Toronto Injury Blog Post will examine the concept of Causation, along with the pitfalls many of us encounter along the way. It’s dedicated to a fellow colleague of mine based out of Toronto who gave sage advice to me in my youth and was a mentor of sort in assisting me in getting in to law school, so where we go. NO OTHER TOPIC IN THE LAW OF TORTS HAS OCASSIONED SO MUCH CONTROVERSY AND CONFUSION AS THE LAW OF CAUSATION. One source of the confusion is a factual question whether the relation between the Defendant’s breach of duty or negligence and the Plaintiff’s injury is one of cause and effect pursuant to scientific or objective standards. If such a casual relationship does NOT exist, that puts the Plaintiff’s case to an END. No policy can be strong enough to warrant the imposition of liability for loss to which a Defendant did not cause, or contribute to. It isn’t enough for a Plaintiff or a lawyer to say that the Defendant’s conduct or breach of duty caused the injury. This does not accord with scientific or objective standards. We need hard evidence. We need some form of proof. How do we prove that scientific or objective standards were or were not met in Court? With experts. Lots and lots of experts. If causation is an issue in ANY personal injury case, you will need an expert to breach that causation bridge and show the insurer, judge and jury that the Defendant’s conduct or breach of duty did in fact CAUSE the harm to the Plaintiff. Without expert evidence, the case won’t be a strong one. Be prepared to spend the money if there is a causation issue. The second element which causes confusion for causation involves the question whether or to what extent the Defendant should have to answer for consequences which his/her conduct or breach of duty has or hasn’t produced. There must be some reasonable connection between the harm threatened, and the harm done. This concept can tie in to liability, but it can also tie back in to causation as well. We frequently see this in medical malpractice or mold cases. How much of the medical malpractice or mold exposure can be tied back to the doctor or owner of the moldy building? How did the doctor’s behaviour or breach of duty cause or contribute to the injuries. All the doctor was doing was performing their job as a doctor. Nothing more, nothing less. What we commonly see applied in determining causation in Canadian Courts is a “robust and pragmatic approach” to fact finding in relation to causation set out in Snell v. Farrell, 1990 CanLII 70 (SCC),  2 S.C.R. 311,  S.C.J. No. 73, at p. 330 S.C.R., and concluded [at para. 73] that “the plaintiff has established, on a balance of probabilities, that the defendants’ negligence materially contributed to the injury“. Causation is established where the plaintiff proves to the civil standard on a balance of probabilities that the defendant caused or contributed to the injury: Snell v. Farrell, 1990 CanLII 70 (SCC),  2 S.C.R. 311; McGhee v. National Coal Board,  3 All E.R. 1008 (H.L.). The general, but not conclusive, test for causation is the “but for” test, which requires the plaintiff to show that the injury would not have occurred but for the negligence of the defendant: Horsley v. MacLaren, 1971 CanLII 24 (SCC),  S.C.R. 441. The “but for” test is unworkable in some circumstances, so the courts have recognized that causation is established where the defendant’s negligence “materially contributed” to the occurrence of the injury: Myers v. Peel County Board of Education, 1981 CanLII 27 (SCC),  2 S.C.R. 21, Bonnington Castings, Ltd. v. Wardlaw,  1 All E.R. 615 (H.L. ); McGhee v. National Coal Board, supra. . . .
Another great case to read is Mustapha v. Culligan Water of Canada. It’s a case out of Windsor, ON which went all the way up to the Ontario Court of Appeal in Toronto; and then to the Supreme Court of Canada in Ottawa. In this case, a man found a fly in his bottle of Culligan Springs water and suffered nervous shock. The problem with the Plaintiff’s case was the concept of foreseeability (which also falls under causation). This is a great case to read for the Supreme Court of Canada’s analysis on this issue. In order to establish causation, a Judge must ask herself as per Athey v. Leonati, whether “the plaintiff has established, on a balance of probabilities, that the defendants’ negligence materially contributed to the injury“. In answering this question, the trial must adopt the “robust and pragmatic approach” to fact finding in relation to causation permitted by Snell v. Farrell. As a rule of thumb, I tell clients to apply the “but for” test to the fact pattern. “But for” the actions/breach of duty/negligence of John Doe, the injuries to Jane Doe would/would not have occurred. As noted above, the “but for” test does not always apply. It all depends on the facts. Think of causation as a bridge between liability and damages. In a successful injury case, there has to be a firm bridge which links liability and damages. If the bridge isn’t stable, or does not exist, the case will fail. As in life, BUILDING BRIDGES doesn’t come cheap. They cost a lot of money. The same applies to establishing causation where it’s an issue in a law suit. Finding a expert to bridge that gap isn’t wasy, and doesn’t come cheap. Bridges can also be destroyed. A tactful and experienced lawyer will know how to crack away at the foundation of that bridge to destroy an accident victim’s case. Attacking their credentials, methodology, even the source documents they were provided in formulating their opinion/hypothesis are all great tools to refute expert testimony. Having an expert of their own is an even stronger tactic. 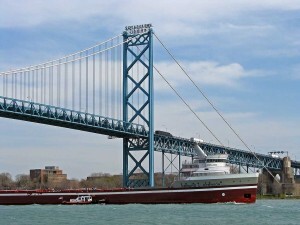 The image depicted in this Toronto Injury Lawyer Blog post is that of the Ambassador Bridge in Windsor. Fitting it would be the image of a bridge with all of this talk about causation. Below the bridge, you’ll see a large SPICE BOAT. I’ve included the image of the spice boat for my colleagues in Windsor ON who hear their whistles along the Detroit River every half hour of so.